Our Legal Compliance Documentation is now complete and will be posted to every SAM Learning subscriber this week, meaning your school will receive these documents by Wednesday, 9 May 2018. The Legal Compliance Documentation is addressed to the Headteacher in all cases and we are in the process of updating our website www.samlearning.com with a copy of this information. Our company approach to GDPR is to operate to the very highest of standards and to adopt and maintain a best-practice methodology. 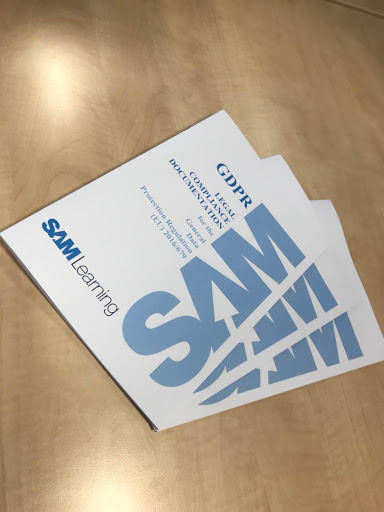 The SAM Learning team has worked incredibly hard, alongside external specialists such as Hill Dickinson LLP, to produce our Legal Compliance Documentation and audit all that we do. SAM Learning would like to say a special thank you to Isabel Williams, Head of Publishing and Sue Street, Chief Education Guru for all their hard work. They have done an excellent job in producing this documentation and it is very much appreciated! Every month our content team publishes new activities and is busy developing content for the following month. More than 5,300 Share activities have been published in Share since the launch. The 'Get to 5' campaign ran in April, with 8 teachers earning a £40 Amazon voucher by publishing their first 5 activities in Share before the end of the month. If you would like to know more about our publishing programme and what's coming soon, please get in touch via email and we will be happy to give you updates specific to your school or subject. Lists of our existing content can be downloaded from the 'download' section on the top right-hand corner after logging in to your teacher account on SAM Learning. This gives visibility of all the activities you and your students can access, including exam board alignments. Stephanie King is our Director of Customer Experience. Her job role includes communicating with subscribers of SAM Learning through Optimisation Meetings to ensure SAM Learning is providing huge value to all schools and that every penny of their investment is being achieved. Our goal is to ensure that our schools are absolutely delighted with SAM Learning and that it contributes strongly to the improvement in student grades and whole school progress. This report shows how much of the assigned work each student has completed, along with their first, last and best score if they have done each activity more than once. 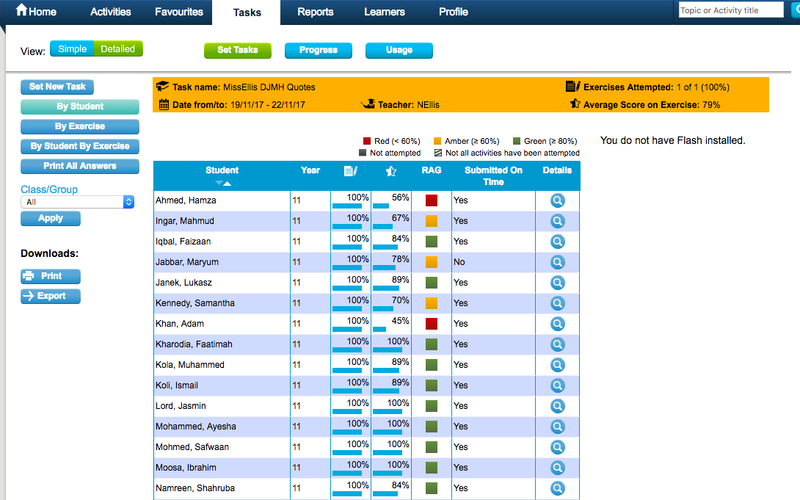 It also uses a Red, Amber, Green system for easy tracking of students’ progress. It can be filtered to show the information by student, by exercise, or both combined. The teacher can also print the students’ answers for self-marked activities (Exam Papers and Test Questions). 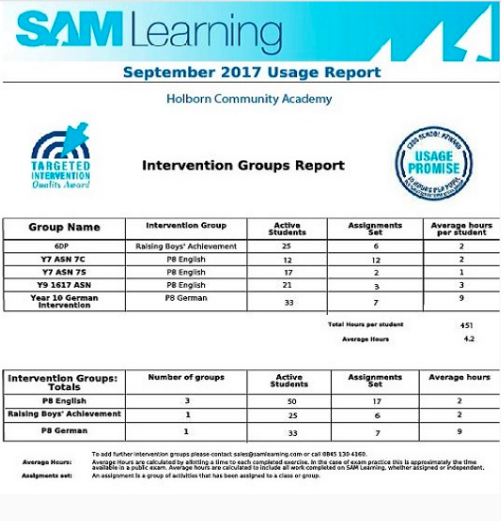 Schools receive this report every week for each of their classes and/or TI groups. The report shows students within that class/group and all the work they have been assigned year to date. 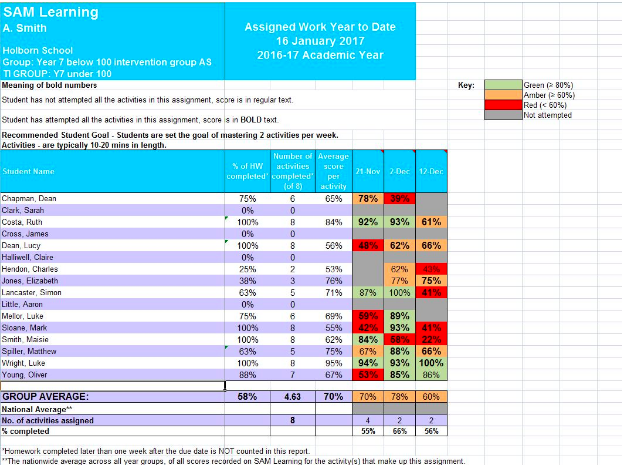 Percentage of work completed is given, along with average score for each assignment. A RAG system is used to track students’ average scores. This report shows data for Targeted Intervention groups and disadvantaged groups (if applicable) as well as whole-school data. It is available from your Account Manager after the 1st of every month. 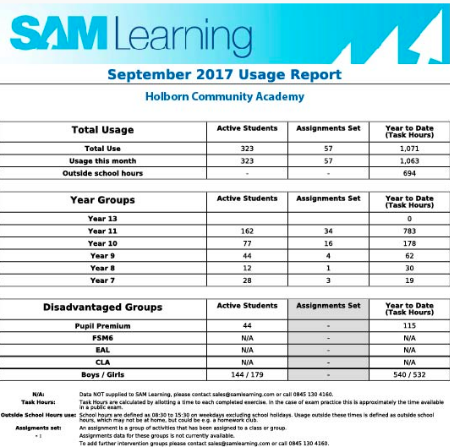 It shows the number of active students, the number of assignments set and the task hours (YTD) broken down by year group, disadvantaged groups (SIMS data) and intervention group. Teacher passwords can be reset by the admin user at the school or by contacting us on support@samlearning.com. Students passwords can be reset under the 'Learners' section within both admin and teacher accounts. SIMS users can use this link to set up SIMS sync for your school. TOP TIP: If the admin password that is linked to SIMS in the data exporter is reset, please ensure you update the data exporter with the new password. If the password is not updated, the SIMS Sync will stop working. For manual uploads, please log in into SAM Learning as an admin user, select Profile > Annual Set-Up Of Your Learners and select 'Export Student Data from other school management software'. Follow the instructions provided and upload the data in the upload section on the 'Annual Set-Up Of Your Learners' page. Teachers have the ability to create their own content. They can access the Activity Builder tool by selecting 'Create Activity' on the platform home page. Add a variety of features to your activity, including audio files, embedded YouTube videos, images and much more... For teachers using Share to make their work available to other SAM Learning schools, a reward scheme is in place with lots of opportunities to earn Amazon vouchers. 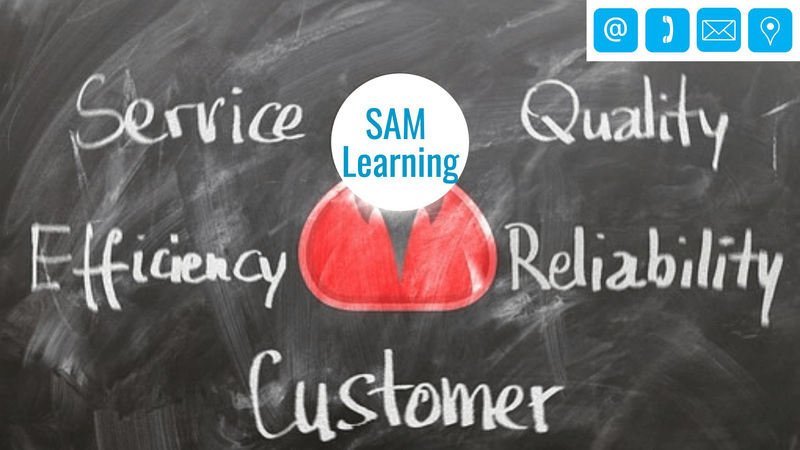 Please contact us on support@samlearning.com for more information. 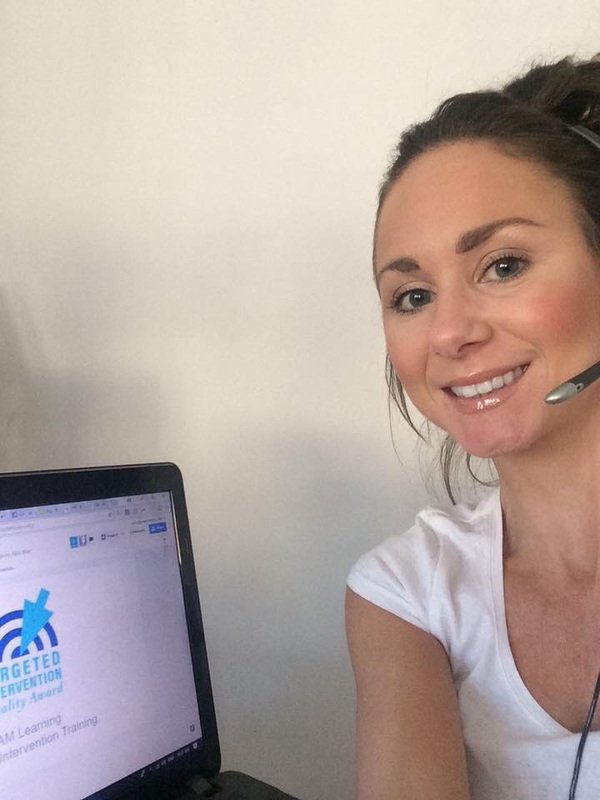 Launch of Live Chat for teachers and social media support – check it out! Alex Owers is our Data Manager and one of our Customer Support Representatives here at SAM Learning. 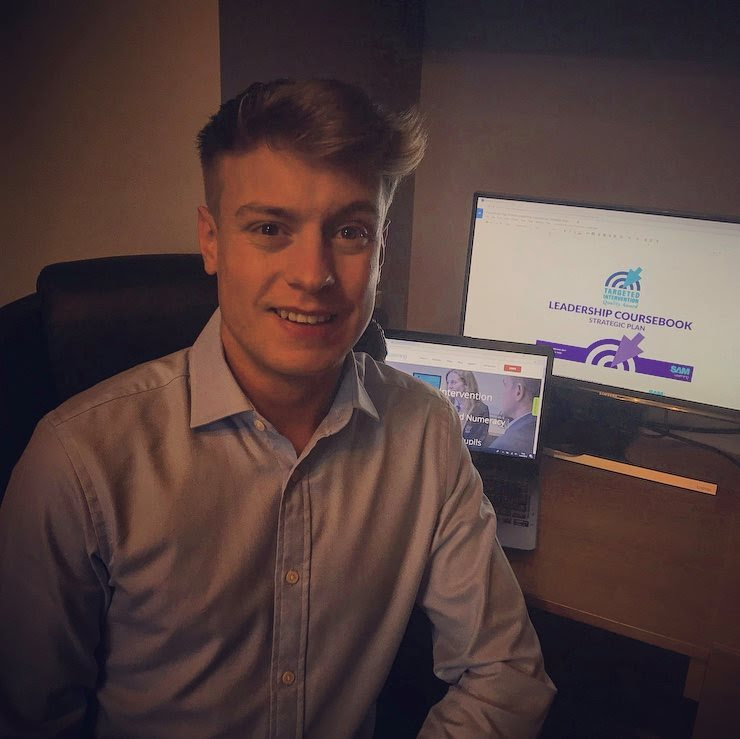 Alex provides high-quality assistance with your SAM Learning enquiries, and also tracks and monitors all of our subscribing schools to ensure that your data is kept relevant and up to date. 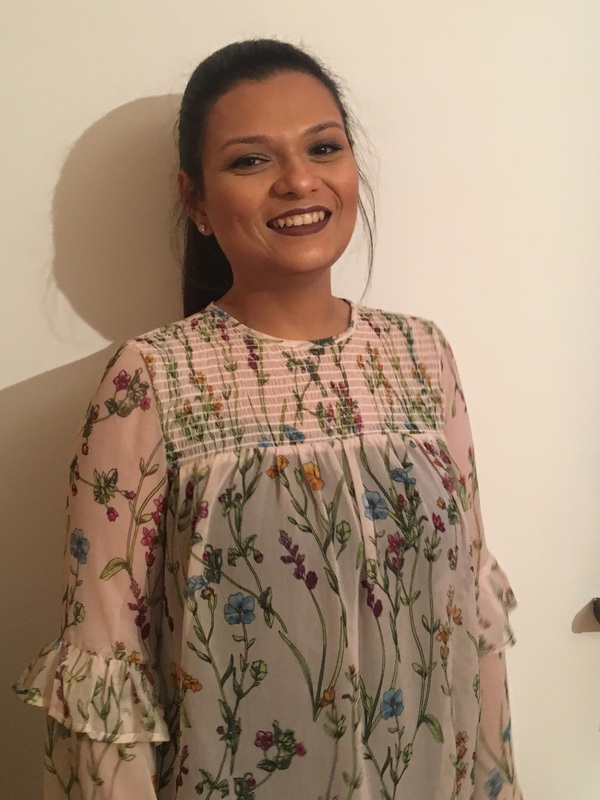 Bhavika Patel joins us as our new Customer Support Operative and will be providing the same high-quality service you expect from the rest of the team. 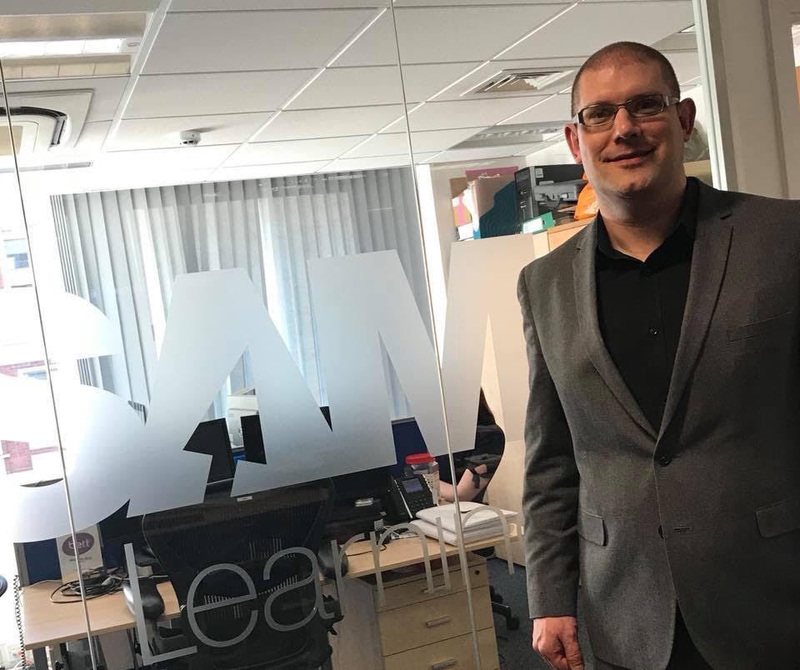 Managing Director Matt Stringer is currently completing an exciting roadshow where he is visiting all SAM Learning subscribers in the UK to introduce himself and thank them personally for their continued support and custom. During his visit, Matt will provide schools with exclusive SAM Learning gifts for both staff and students, as well as talking them through how SAM Learning can add optimum value to the school, aligning it with the school's development plan and internal strategies. That way, schools are guaranteed to get the most value from our product and services. Matt will 100% ensure that SAM Learning is a huge asset in the school. If you feel that SAM Learning is not adding optimum value to your school for any reason then Matt will rectify this immediately for you. No matter what your doubts are with SAM Learning, no matter how big or small, this will be resolved. Matt has visited over 50 secondary schools so far since 1 January 2018 and is delighted with the feedback received to date and most importantly with the impact SAM Learning is clearly having in schools. If you would like to meet Matt at your school or over the telephone, please call 0207 025 0621. 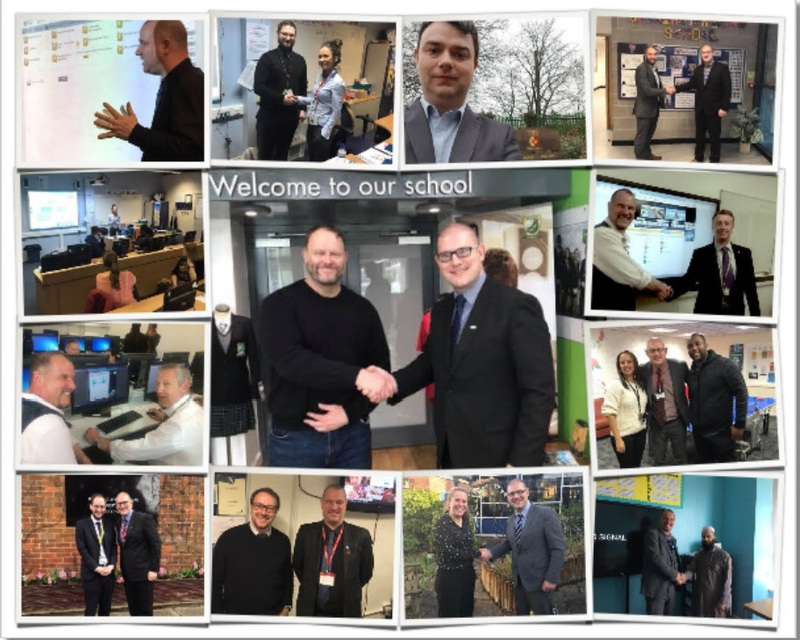 Below are a small selection of pictures of SAM Learning recent visits and the impact of SAM Learning within those schools. 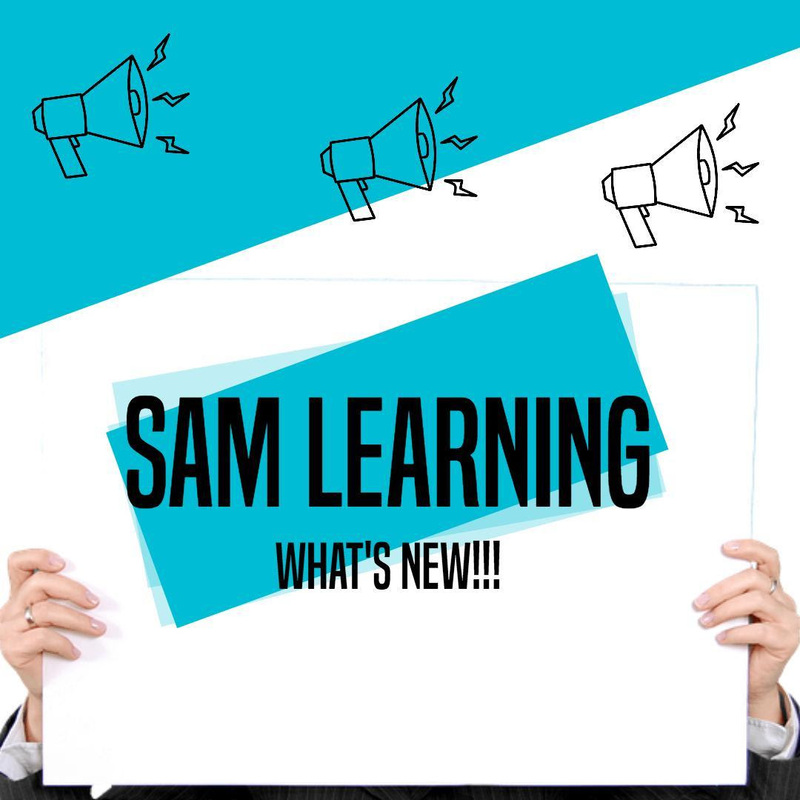 How do I log in to SAM Learning?